Isn't this just gorgeous? 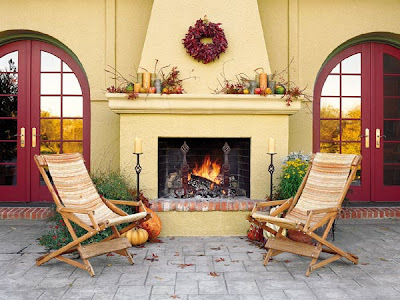 While I'm sure we'd all love to have an outdoor fireplace, many of the ideas presented work well for any home. The idea is to create a cozy atmosphere. The mums and pumpkins tucked into the corners by the patio furniture add a bit of color and fall foliage. And even if we can't have a roaring fire, anyone can add a few candles to their outdoor spaces. The warm, but bright color of the wreath adds a lovely contrast that nicely coordinates with the doors. Flower boxes which once overflowed with gorgeous pinks can be planted with mums and hardier fall flowers or nestled with pumpkins and wheat sheafs, branches and berries. Have you ever stuffed a scarecrow for your front lawn? It could be a fun project to do with children.